Замечательный торт \"Килиманджаро\", эффектный и оригинальный, но при этом совершенно несложный. Попробуйте приготовить! Good day! Welcome to my channel! Today I'm making a "Kilimanjaro" cake I found this recipe online, it attracted me with its unusual design. 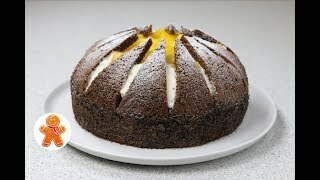 The cake is tender, tasty and beautiful And it's easy to make it Let's get started. For the sponge cake we are going to need 5 middle-sized eggs, 130 g of all-purpose flour, 180 g of sugar 50 g of butter, 30 g of cocoa powder, 5 g of baking powder and 8 g of vanilla sugar. Melt the butter and let it cool mix the flour, cocoa powder and baking powder mix as thoroughly as possible so the baking powder is well mixed in and the sponge cake bakes evenly then sift the mixture I'm going to make the batter without separation into yolks and whites so I add the whole eggs in a bowl of a mixer add the vanilla sugar set a whisk attachment and gradually adding the sugar whip up the eggs into light and airy mixture it takes quite a long time the mixture must double in volume and be light and airy be very thick to form a print on the surface of the batter. For a few seconds and only once your batter is this consistency you can add the flour and cocoa mixture add slowly for 3-4 times very carefully move the spatula up from the bottom from the edges to the centre in order to save the volume we achieved by beating the eggs. Add the butter in the very end. In order to mix the butter easier and the butter doesn't sink to the bottom I mix the melted butter with 2-3 tbsp of the batter and then carefully add the butter-batter mixture into the actual batter I'll bake the cake in a springform pan 24 cm in diameter. I've layered the bottom with some parchment paper and left the edges ungreased you can swirl the form in order to make the cake more even bake at 180 degrees Celsius. For 35-40 minutes Don't open the door of the oven for first 20 minutes otherwise the cake won't rise in order to check whether it's ready or not, you can press the centre of the cake the finger musn't fall in or with a help of a wooden stick inserted into the centre of the cake it has to be clean without any butter on it put the freshly baked cake on a cooling rack and let it cool you can cool it inverted. Once the cake is cooled, you can cut it out of the form run a sharp knife around the edges release the form. The cake is quite thick before cutting the cake, you need to let it sit for 4-5 hours. The cake is high, so it's easy to slice it into 3 layers the top layer has to be a little bit thinner we are going to cut this layer into 12 pieces it's much better if it's even put the first layer on a serving plate. Cut the centre from the middle layer so that to create the borders 1.5 cm thick save the cut centre put the borders on the first layer. Set a baking ring cut the top layer into 12 equal pieces for the cream we will need 400 g of yogurt 400 g of heavy-whipping cream usually I use 35 % fat content heavy-whipping cream a large can of preserved peaches which is 850 g 15 g of gelatin and 50 g of icing sugar or up to your taste drain the peaches and cut them into big pieces as a result, we have the peaches and syrup we are going to use the syrup for activating the gelatin and for soaking the layers take 150 g of the peach syrup add the gelatin and let it sit so the gelatin soakes the syrup soak the layers of the cake with the peach syrup soak the bottom layer liberally. Soak the middle layer I soak only the bottoms of the cut layer I don't soak this narrow part of a triangle so it doesn't fall off while we're building the cake take the cold whipping cream because the cream must be cold in order to be whipped so put the cream into the fridge beforehand. Whip up the cream with the icing sugar the amount of sugar is up to you. Don't overwhip the cream the cream must maintain its form but still be soft heat up the soaked gelatin so it's all dissolved don't boil the gelatin otherwise the gelatin loses its power it's usually warmed up to 60 degrees Celsius. Mix the gelatin with the yogurt and then carefully add the whipped cream I will be mixing it with a hand-held mixer but quickly at low speed. The light and tasty cream is done. I'll add to the cream about 2/3 of all the peaches. I'll save 1/3 of the peaches these peaches I'm going to out on top of the cake put 1/3 of all the cream to fill the bottom and create a dome. Put the cut layer tightly. And press the pieces with the cream. Put the middle cut layer even it out and set the rest of the pieces. Put the rest of the cream on top. As well as saved peaches I'll release the ring to even out the cake but it's not necessary. Set the ring back and pop the cake into the fridge for a few hours so the cream sets for decorating we will need 50 g of chocolate 1/2 of which I've chopped with a knife and the rest I will melt spread the melted chocolate over the bottom. Then decorate it with chopped cholocate. Sprinkle the top of the cake with some icing sugar. The cake is done it's light, tender and very delicious. So our cake is ready Have a nice meal!.